Aurora, IN, located in the rolling hills of the Ohio River Valley, is a place where “livability” is valued and treasured. From its historic downtown to the local shops and businesses, Aurora encompasses what it means to be a community that thrives. Living here provides a low cost-of-living, plenty of amenities, ample housing opportunities, great employment prospects, safe neighborhoods, and a focus on quality education of all levels. Life in Aurora ranges from very rural to small town charm, yet it is: within minutes of interstate access, only 25 minutes to the Cincinnati/Northern Kentucky International Airport, and less than 45 minutes from Northern Kentucky and Cincinnati. This makes Aurora a versatile location that will provide one the opportunity to experience the fast or slow lifestyle they are seeking, yet that won’t break their bank to achieve it. It is the perfect place to live, thrive, and commute to Cincinnati’s MSA, or you can find a job locally in its growing industrial or commercial areas. Many Aurora residents enjoy the safety that a small town atmosphere provides, along with the healthy environment and civic engagement. Aurora is also home to South Dearborn Community School Corporation where their mission is to “Grow, Excel, and Achieve.” Ranked within the top 35 schools of the Tri-State region, South Dearborn offers a wide variety of educational and extracurricular opportunites for K-12 education. From their “High Ability Program” that focuses on students performing at outstanding levels to their enhanced curriculum that provides students with dual credit in 2 and 4 year colleges, South Dearborn offers their students an education that focuses on tangible skills needed in the workplace or furthering their education. Aurora is located 12 minutes from Ivy Tech Community College (Lawrenceburg Campus). Ivy Tech is a 2 year skills based college and IN's largest public postsecondary institution. Ivy Tech Lawrenceburg provides students with an education that is employment centered. Healthcare, technology, and business & public services are all staples at Ivy Tech, allowing students to enter the workforce prepared or continue their education at a local or regional 4 year institution like Northern Kentucky University, University of Cincinnati, Indiana University (East), University of Dayton, or Xavier University. With Ivy Tech’s focus on advanced manufacturing and technology, they have begun construction on an Advanced Manufacturing and Technology Center at their Lakefront Campus. Its focus will be to provide training in welding, Computer Numeric Controls (CNC), machining, robotics, economic development, and other advanced skills. In Aurora, there are a wide variety industry sectors. There are many small businesses in downtown Aurora that help keep the local economy vital and provide employment for local residents. Finance, real estate, insurance, retail, and general services account for a large majority of small business operations, providing our citizens with numerous and unique opportunities. More importantly, Aurora supports local businesses and the important role they play to strengthen and bolster Southeast Indiana's economy. Local businesses bring distinctive talent to the area, creating an environment in which the residents can enjoy living. Aurora also provides a range of small businesses, including salon and spas, hobby shops, and exceptional restaurants and bakeries. Aurora has also proven itself as a leader in manufacturing. This dynamic sector is comprised of a variety of consumer and industrial manufacturing, including Aurora Casket Company, Stedman Machine Company, Consolidated Grain & Barge, and D & S Machine. Aurora's manufacturing companies bring vast amounts of employment and growth to the region and provide services that are unique to the area. With convenient access to numerous resources like the Ohio River, U.S. 50, and I-275, Aurora's businesses will continue to thrive and prosper, providing a positive impact to the region. Venturing into downtown Aurora offers ample opportunity to enjoy attractions ranging from Hillforest Mansion, listed on the National Register of Historic Places and designated a National Historic Landmark, to Aurora’s many parks such as Lesko Park, located directly on the Ohio River. Residents and visitors can even head up to Verastau Historic Site or over to Aurora City Park’s many facilities. Verastau is a great venue for weddings, receptions, and special events of all kinds. The Aurora City Park houses the Aurora Public Pool, the Clayton Batchelor Pavilion, the Civic Center, the Round Barn, and the Boy Scout Cabin which makes this park a focal point of community activity. Aurora offers numerous amenities to its residents that are enjoyed by all ages. Its partnership with Lawrenceburg has been fruitful, allowing both cities to achieve a 6.7 mile recreation trail on which you can find locals walking, biking, running, and rollerblading. The paved trail follows the Ohio River and runs parallel to many historic sections of Aurora and Lawrenceburg. As noted by Indiana Trails, the surrounding region and trail presents ”various points of interest to visit whether you’re inclined toward the arts, science, outdoor activities, pre-history and history, riverboat gaming, local eateries, shops, and/or farm markets (including pumpkin, berry, and orchard) sites.” It truly is a wonderful venture out into nature, providing residents with a great opportunity reconnect with themselves, others, and their wellbeing. Aurora’s focus on quality never stops, as we are looking to expand the trail down to Rising Sun. 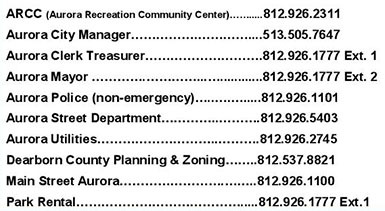 Aurora’s own community center, the Aurora Recreational Community Center (ARCC), features numerous community themed activities for local residents. Whether residents are looking to shoot some hoops with their friends or take a group fitness class, the ARCC offers excellent workout equipment, a family atmosphere, knowledgeable staff, a convenient location, and a full court basketball gym. The ARCC is also located next to additional baseball, football, and soccer fields where communities gather for peewee football and other events.